2017 Oreion reeper two-door sport 1100 cc 4cyl two seater manual UTV ATV. This particular unit is equipped with powder coated alloy 15 inch wheels and aggressive treaded DOT and off-road tires, stereo, tubular front bumper with winch, tow hitch, trailer wiring harness, coil over reservoir shocks with lift, skid plate, pushbutton 4x4, Locking front and rear differentials, horn, signals, brake lights, high low beam HRD style lights, seatbelts, dual exhaust, tow receiver loop hooks, and much more. We have been driving our demo model quite a bit and these are a blast to drive on and off the road. And nothing short of extreme attention getters everywhere you go these things stand out in the crowd. Stop by and see these things in person and let us show you what the potential is. We are proud to be one of the very few Elite Dealers for Oreion Street / Off Road 2 and 4 door buggies. 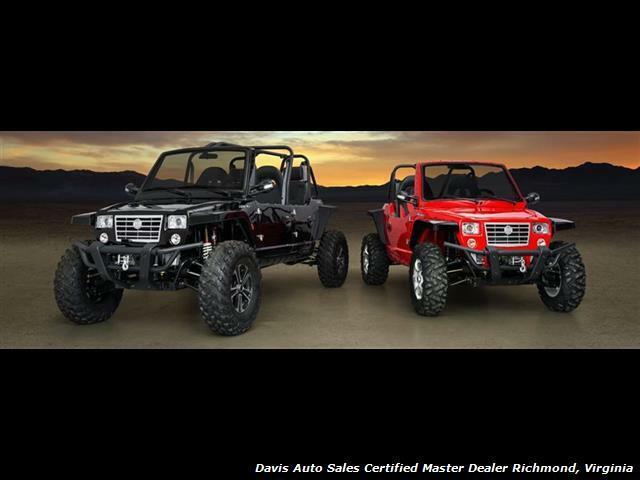 Basically miniature Jeeps these 4x4 machines are powerful and street drivable in most states with amazing features that make them practical and very affordable. With all the creature comforts of a street machine, but off road ability similar to a Side by Side RZR, Artic Cat, Can-am etc. Perfect for running the sands of the OBX or climbing the trails of Busco Beach or the Hatfield / Mccoy trails. Some features include front and rear locking Diffs, manual shift transmission, up to1100cc engines, standard install on all units front bumpers and winch, and much more. These units are NADA and KBB recognized so finance options should not be a problem and accessories galore are right around the corner. Our 9 bay service facility is ready for all service and upgrade items needed and our staff is trained to make these units trouble free. Below is a list of features per unit and we are ordering these in as fast as we can to hopefully keep up with the growing demand. Starting at $15,495 - $19,995. Price points are incredible for what you get for your money!!! Call for details and put your order in for the next batch to arrive. 804-271-0030 This vehicle is at our 10016 Jefferson Davis Highway, Richmond, Va. 23237 location.